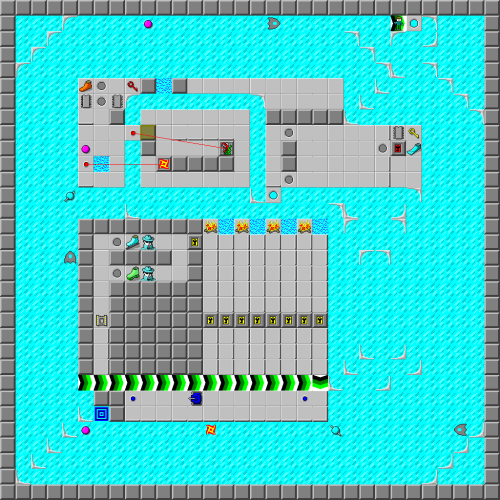 Icehouse - The Chip's Challenge Wiki - The Chip's Challenge Database that anyone can edit! Icehouse is the 102nd level in Chip's Challenge 1. The outside of Icehouse is a long series of ice tracks which hold the monsters behind Chip from where he stands. This leaves not a lot of space for the rest of the level, but what is in that small space is intricately designed. To simplify the route significantly, the player should click *R, which will perform the required [1/2] for Chip. When Chip lands, play to the left and up to collect four goodies, then drop below the cloning teeth and work all the way 4R past a recessed wall, then D onto another ice track to reach more goodies. Take the track back out, drop onto the fire and water below that, open the yellow lock, and collect the suction boots which will be used below to step into the exit. This page was last edited on 27 February 2019, at 12:15.